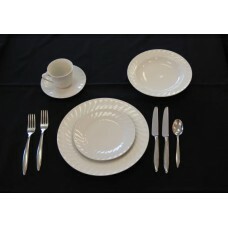 Dish - All White Saucer (20/rack) Basic all white dishes. Great for any occasion! Tea Cup (2.. Dish - White Soup Bowl 6.5"
Dish - All White Soup Bowl 6.5" (15/rack) Basic all white dishes. Great for any occasion! Te.. Dish - White Square Cup sm (16/rack) Cup Small (16/Rack) Saucer (20/Rack) Salad P.. 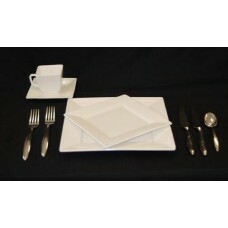 Dish - White Square Cup tall (16/rack) Cup Small (16/Rack) Saucer (20/Rack) Salad.. Dish - White Square Salad Plate 7"
Dish - White Square Salad Plate 7" (20/rack) Cup Small (16/Rack) Saucer (20/Rack)&.. Dish - White Square Saucer (20/rack) Cup Small (16/Rack) Saucer (20/Rack) Salad P.. Dish - All White Sugar Bowl Basic all white dishes. Great for any occasion! Tea Cup (20/Rack.. Dish - White Swirl Cup (25/rack) White dish with lovely swirl patter Cup (2.. Dish - White Swirl Lunch Plate 9"
Dish - White Swirl Lunch Plate 9" (24/rack) White dish with lovely swirl patter&nbs.. Dish - White Swirl Salad Plate 7"
Dish - White Swirl Salad Plate 7" (24/rack) White dish with lovely swirl patter&nbs.. Dish - White Swirl Saucer (24/rack) White dish with lovely swirl patter Cup (25/Rack) .. Dish - White Swirl Soup Bowl 8"
Dish - White Swirl Soup Bowl 8" (15/rack) White dish with lovely swirl patter .. 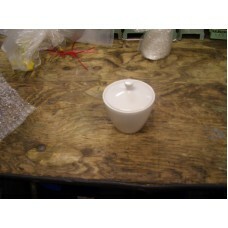 Dish - All White Tea Cup (20/rack) Basic all white dishes. Great for any occasion! Tea Cup (.. Dish - White w/ Gold Trim Salad Plate 7.5"
Dish - White w/Gold Trim Salad Plate 7.5" (20/rack) White/..